I have another one of the new Sally Hansen Xtreme Wear polishes to show you. This is probably my favorite line of polishes Sally Hansen offers. The colors are great and the price is right. I haven't been impressed much with Sally Hansen's color offerings lately, but this one definitely caught my eye. 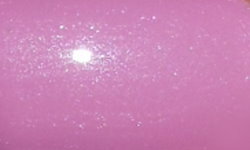 Orchid Around is a soft orchid with a subtle silvery shimmer. Color: I love orchid colors like this, but I can't always wear them. Some colors like this can really bring out too much red/pink in my skin tone and make my skin look ruddy. This one doesn't do that. I love this shade of purple-pink very much. The shimmer in this is very subtle and I did not detect it in the bottle much, but it is somewhat visible on the nail. Formula: The formula on this was alright. I had high hopes after the excellent formula Dabbler, another color from this collection had. This one didn't quite live up to those expectations. It wasn't bad at all, but it did have a bit of leveling issues. Price: I got this around $3 at Walgreens. Overall: I really love the color of Orchid Around. The color is soft and light, but wearable and flattering at the same time. The price is really great for color like this too at the drugstore. The formula could be a bit better, but wasn't a deal breaker at all. That's very pretty. I love the shimmer.